Membership software company Wild Apricot has developed two new resources to help organizations improve their membership renewal letters. Whether you send it by mail or email, a membership renewal letter is one of the most important tools in an organization’s toolbox. Membership software company Wild Apricot has developed two new resources to help organizations improve their membership renewal letters. 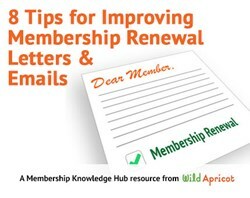 “8 Tips for Improving Membership Renewal Letters and Emails” and the accompanying “Membership Renewal Letter Checklist” are now available for free in Wild Apricot’s Membership Knowledge Hub. The article and checklist look at a variety of considerations to take when revising your membership renewal letters, such as tone, personalization, member benefits, communication timelines, and more. The checklist provides a key set of questions to ask while revising membership renewal communications, including steps for action. Wild Apricot is a leader in membership management -- according to Capterra’s software directory, they’re the #1 rated membership management software on the market. Designed to help small membership organizations manage their membership database, events, website, communications, and online payments, Wild Apricot users have the ability to fully customize their email communications to members, including setting customized renewal notice timelines and including personal information automatically. A variety of resources providing best practices for small membership organizations are available in Wild Apricot’s Membership Knowledge Hub, in the areas of membership management, volunteer management, technology, marketing and communication, event management, and more.